"Theron Healy is an iconic builder, the most important and prolific vernacular master builder of the golden age of Minneapolis architecture (1885-1915). The Orth House, at 2320 Colfax Avenue South, is Healy's turning-point house in his transition from designing and building the romantic Queen Annes of the Healy Block and the North Wedge, to the more classically inspired designs on the 2400 block of Bryant Avenue South and his houses on Lowry Hill. Healy's career is divided in two--before 1893 and after 1893. There was an economic crash in 1893 similar to what we experienced in 2008, only more severe. The Chicago World's Fair of 1893 with its centerpiece, the White City, profoundly changed American architecture. It finished off the Queen Anne Style that Healy was so adept at and introduced both the Neo-Classical and the Colonial Revival styles. Whether this house was built for a specific client or on speculation is unknown. Given the economic crisis of 1893, it's possible that the house was built for a client that could no longer afford it when it was completed. The house was advertised for sale in 1894 in a Minneapolis newspaper. It was purchased by Edward F. Orth the son John Orth of the Orth Brewery Company which later became the Minneapolis Brewing Company. 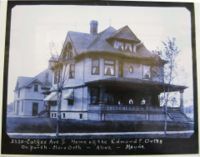 Edward was also president of the City Ice Company, Orth Brothers and the Coe Commission Company while living at Colfax. The second owner of 2320 Colfax was Thomas Kenyon who had worked as a traveling salesman for patent medicines. He invented a medicine for treating chest congestion named Kondon's Catarrhal Jelly, which was initially manufactured at the house. Kenyon distribution of free samples resulted in national and international sales. Kenyon was also a banker and an automobile enthusiast. He and his wife Effie DeMille were also founders of Fowler Methodist church on Dupont and Franklin Avenue. In the Fall of 2012, Michael Crow, the owner of the house announced his intention to sell it to developer Michael Lander. 2320 Colfax was demolished on February 25, 2015. Motiv apartments were built on the site. 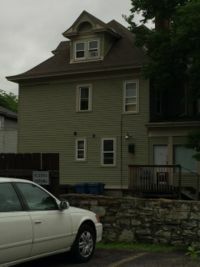 The demolition of the Orth house was opposed by some residents of the Lowry Hill East neighborhood and the Healy Project,an organization dedicated to the preservation of the work of master builder Theron Potter Healy.